Italian poet, writer, physician, and rabbi; born Feb. 2, 1644, at Padua; died there June 8, 1723. 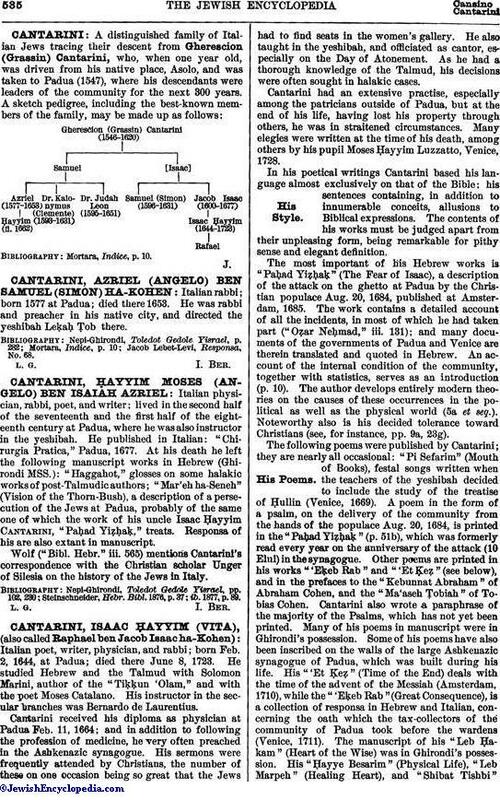 He studied Hebrew and the Talmud with Solomon Marini, author of the "Tiḳḳun 'Olam," and with the poet Moses Catalano. His instructor in the secular branches was Bernardo de Laurentius. 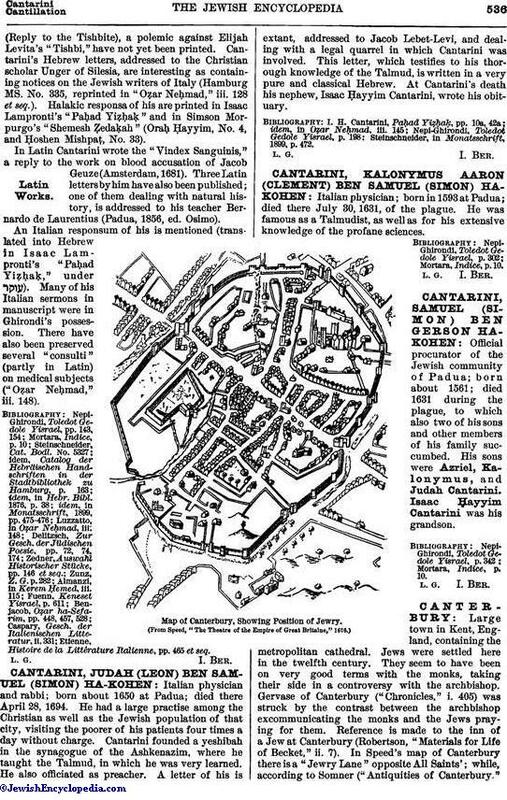 Cantarini received his diploma as physician at Padua Feb. 11, 1664; and in addition to following the profession of medicine, he very often preached in the Ashkenazic synagogue. His sermons were frequently attended by Christians, the number of these on one occasion being so great that the Jews had to find seats in the women's gallery. He also taught in the yeshibah, and officiated as cantor, especially on the Day of Atonement. As he had a thorough knowledge of the Talmud, his decisions were often sought in halakic cases. Cantarini had an extensive practise, especially among the patricians outside of Padua, but at the end of his life, having lost his property through others, he was in straitened circumstances. Many elegies were written at the time of his death, among others by his pupil Moses Ḥayyim Luzzatto, Venice, 1728. In his poetical writings Cantarini based his language almost exclusively on that of the Bible; his sentences containing, in addition to innumerable conceits, allusions to Biblical expressions. The contents of his works must be judged apart from their unpleasing form, being remarkable for pithy sense and elegant definition. The most important of his Hebrew works is "Paḥad Yiẓḥaḳ" (The Fear of Isaac), a description of the attack on the ghetto at Padua by the Christian populace Aug. 20, 1684, published at Amsterdam, 1685. The work contains a detailed account of all the incidents, in most of which he had taken part ("Oẓar Neḥmad," iii. 131); and many documents of the governments of Padua and Venice are therein translated and quoted in Hebrew. An account of the internal condition of the community, together with statistics, serves as an introduction (p. 10). The author develops entirely modern theories on the causes of these occurrences in the political as well as the physical world (5a et seq.). Noteworthy also is his decided tolerance toward Christians (see, for instance, pp. 9a, 23g). The following poems were published by Cantarini; they are nearly all occasional: "Pi Sefarim" (Mouth of Books), festal songs written when the teachers of the yeshibah decided to include the study of the treatise of Ḥullin (Venice, 1669). A poem in the form of a psalm, on the delivery of the community from the hands of the populace Aug. 20, 1684, is printed in the "Paḥad Yiẓḥaḳ" (p. 51b), which was formerly read every year on the anniversary of the attack (10 Elul) in the synagogue. Other poems are printed in his works "Eḳeb Rab" and "'Et Ḳeẓ" (see below), and in the prefaces to the "Kebunnat Abraham" of Abraham Cohen, and the "Ma'aseh Ṭobiah" of Tobias Cohen. Cantarini also wrote a paraphrase of the majority of the Psalms, which has not yet been printed. Many of his poems in manuscript were in Ghirondi's possession. Some of his poems have also been inscribed on the walls of the large Ashkenazic synagogue of Padua, which was built during his life. His "'Et Ḳeẓ" (Time of the End) deals with the time of the advent of the Messiah (Amsterdam, 1710), while the "'Eḳeb Rab" (Great Consequence), is a collection of responsa in Hebrew and Italian, concerning the oath which the tax-collectors of the community of Padua took before the wardens (Venice, 1711). The manuscript of his "Leb Ḥakam" (Heart of the Wise) was in Ghirondi's possession. His "Ḥayye Besarim" (Physical Life), "Leb Marpeh" (Healing Heart), and "Shibat Tishbi"(Reply to the Tishbite), a polemic against Elijah Levita's "Tishbi," have not yet been printed. Cantarini's Hebrew letters, addressed to the Christian scholar Unger of Silesia, are interesting as containing notices on the Jewish writers of Italy (Hamburg MS. No. 335, reprinted in "Oẓar Neḥmad," iii. 128 et seq.). Halakic responsa of his are printed in Isaac Lampronti's "Paḥad Yiẓḥaḳ" and in Simson Morpurgo's "Shemesh Ẓedaḳah" (Oraḥ Ḥayyim, No. 4, and Ḥoshen Mishpaṭ, No. 33). In Latin Cantarini wrote the "Vindex Sanguinis," a reply to the work on blood accusation of Jacob Geuze (Amsterdam, 1681). Three Latin letters by him have also been published; one of them dealing with natural history, is addressed to his teacher Bernardo de Laurentius (Padua, 1856, ed. Osimo). An Italian responsum of his is mentioned (translated into Hebrew in Isaac Lampronti's "Paḥad Yiẓḥaḳ," under ). Many of his Italian sermons in manuscript were in Ghirondi's possession. There have also been preserved several "consulti" (partly in Latin) on medical subjects ("Oẓar Neḥmad," iii. 148). Etienne, Histoire de la Littérature Italienne, pp. 465 et seq.